A unique case of eyelid metastasis from nasopharyngeal chondroid chordoma in a 63-year-old woman was reported. Chordomas are rare tumors of the bone deriving from remnants of the embryonic notochord. Histologically, the tumor showed lobulated structure and concludes two types of cells: liquid drop cell and small round/cubic cell. Immunohistochemically, AE1/AE3, epithelial membrane antigene (EMA), and S100 showed a uniform and strong positivity. It has a great capacity for recurrence and malignant transformation, despite their slow-growing nature. The most common sites of metastases are liver, lungs, and bones. The eyelid metastasis from chordoma is an extremely rare finding, which may suggest a poor prognosis for the patient. Its significant clinicopathological characteristic could prompt us to take it into consideration when assessing the patient's prognosis. Chordoma is a slow-growing malignant tumor originating from remnants of the notochord. It is mostly located in the sacrococcygeal region and usually appears in young individuals and is much more aggressive. The incidence of distant metastasis varies, ranging between 3% and 50% among the different series.,, The most common sites of metastasis are liver, lungs, and bones. Recently, one case report has found the skin metastasis. We present here the unusual case of a 63-year-old woman with eyelid metastasis from a nasopharyngeal chondroid chordoma. 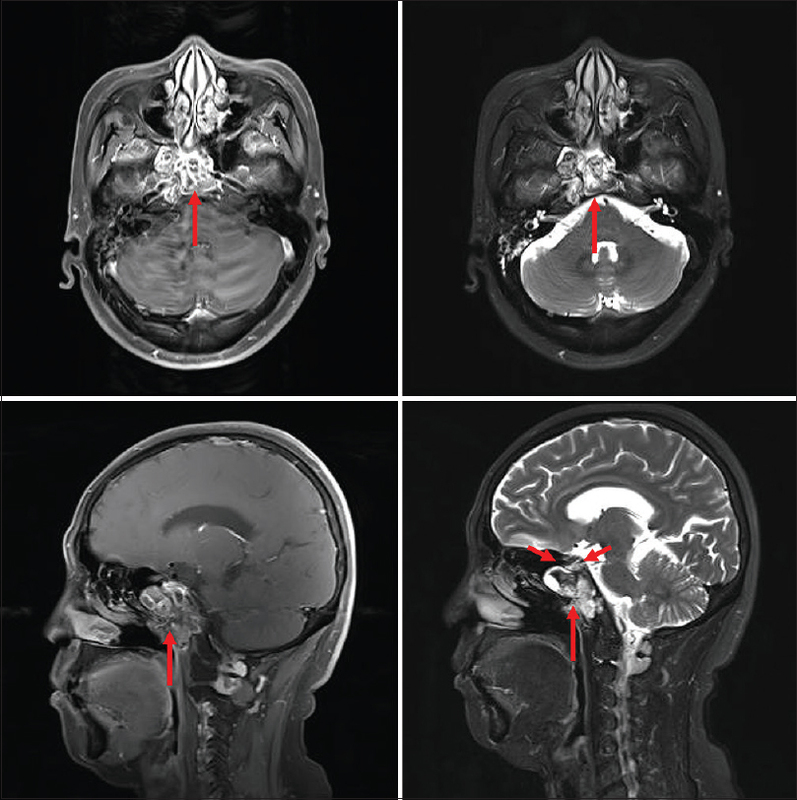 A 63-year-old woman had nasopharyngeal chordoma diagnosed in 2013. She initially complained of a 3-month history of ear fullness and hearing loss. 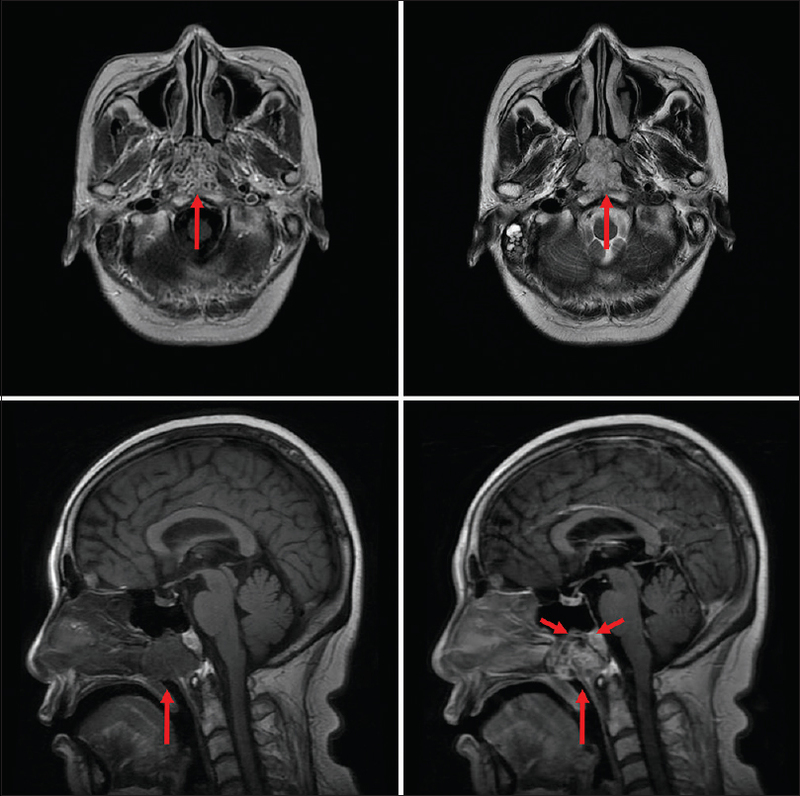 In early 2013, magnetic resonance imaging (MRI) and enhanced MRI showed a 3 × 2 × 2 cm soft tissue tumor located at nasopharyngeal [Figure 1]. She underwent excision of tumor as soon as possible. The pathology report revealed a white-grayish/red mass [Figure 2]a. Microscopically, at low power, the tumor showed lobulated structure [Figure 2]b; at high power, the tumor concludes two types of cells: One is liquid drop cell (as shown by the arrow mark), in which there are great mucus like substance. This mucus like substance is present in and outside of the tumor cell. The other type is small round or cubic cell, which has eosinophilic cytoplasm. In addition, we can also see the area of cartilage-like tissue [Figure 2]c. Immunohistochemically, AE1/AE3, EMA, and S100 protein were diffusely positive throughout the lesion, with CD68 was negative [Figure 2]d,[Figure 2]e,[Figure 2]f,[Figure 2]g. Proliferative index Ki-67 was approximately 10% [Figure 2]h. These findings were concordant with chondroid chordoma. Twenty-seven months after surgery, asymptomatic locoregional recurrence was found on MRI [Figure 3]. The lesion was completely excised. Pathological findings confirmed chordoma recurrence, and adjuvant radiotherapy was administered. In August 2016, she subsequently had a firm, nontender, erythematous nodule measuring 1.5 × 1 × 0.7 cm under the lid skin of lower lid of right eye [Figure 4]a. She was referred to a dermatologist, and the lesion was excised. 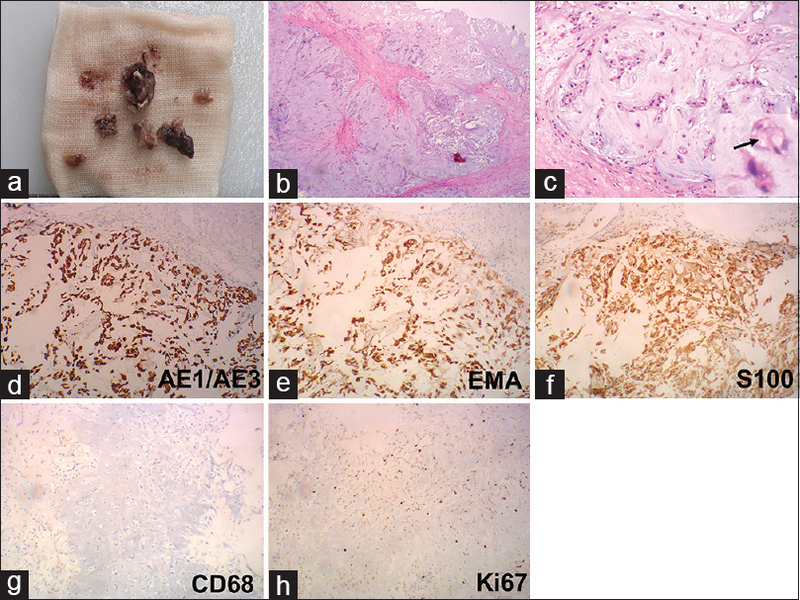 Pathological examination found skin metastasis from chondroid chordoma, with immunohistochemical characteristics consistent with the primary tumor [Figure 4]b,[Figure 4]c,[Figure 4]d,[Figure 4]e,[Figure 4]f. Now, although best supportive care is offered, the patient's physical condition is getting much worse, which indicates that there is no long time for her life. Chordomas are rare tumors of the bone with an average incidence of 0.1/100,000/year. They are slow-growing tumors that typically remain silent until advanced stages of the disease when they present with locally aggressive behavior and clinical manifestations that vary depending on their location. In clinically, MRI is usually used to characterize the localization and size of the tumor, which is very helpful for doctors in operation. Depending on its histopathology, chordomas may present as three different variants: classical (the most frequent variant), chondroid, with cartilage-like tissue areas, and dedifferentiated. Most of the previously reported cases were classic variants of chordoma with a few exceptions. The diagnosis may be challenging because of the tumor's histological similarities with other chondroid lesions. Immunohistochemical staining is useful and is characterized by the tumor's reactivity to epithelial markers. Triple positivity to cytokeratins, EMA, and S100 is a sensitive marker in the diagnosis of this tumor, as it is present in 75%–100% of cases. The ideal treatment is through an aggressive surgical approach. Classic chemotherapy shows limited efficacy. Molecular research shows that overexpression of KIT receptors suggest a responsiveness to imatinib. In this case, CD117 was also detected by immunohistochemical staining, but it is negative. Despite an increase in the last decades in the number of reports describing skin involvement in chordomas,, these have been commonly related to direct invasion or locoregional involvement, whereas eyelid metastases have remained an extremely uncommon presentation in these tumors. From this case, we speculate that skin metastases may present as a clinical manifestation of advanced disease. Although sometimes skin metastases may be the first symptom of the disease, they generally present as a clinical manifestation of advanced disease, when metastases in other sites are already present. This work was financially supported by The First Affiliated Hospital of Zhengzhou University. National Natural Science Foundation of China(81803011). Henan Provincial Department of Science and Technology Research (82102310512). Chambers PW, Schwinn CP. Chordoma. A clinicopathologic study of metastasis. Am J Clin Pathol 1979;72:765-76. Bjornsson J, Wold LE, Ebersold MJ, Laws ER. Chordoma of the mobile spine. A clinicopathologic analysis of 40 patients. Cancer 1993;71:735-40. Higinbotham NL, Phillips RF, Farr HW, Hustu HO. Chordoma. Thirty-five-year study at memorial hospital. Cancer 1967;20:1841-50. Riesco-Martínez MC, Parrilla-Rubio L, Enguita-Valls AB, Delgado-Márquez AM, Ruste SA, López-Martín JA, et al. Aunique case of distant skin metastasis from chondroid chordoma. JAAD Case Rep 2016;2:63-6. Casali PG, Stacchiotti S, Sangalli C, Olmi P, Gronchi A. Chordoma. Curr Opin Oncol 2007;19:367-70. Boriani S, Bandiera S, Biagini R, Bacchini P, Boriani L, Cappuccio M, et al. Chordoma of the mobile spine: Fifty years of experience. Spine (Phila Pa 1976) 2006;31:493-503. Jambhekar NA, Rekhi B, Thorat K, Dikshit R, Agrawal M, Puri A, et al. Revisiting chordoma with brachyury, a “new age” marker: Analysis of a validation study on 51 cases. Arch Pathol Lab Med 2010;134:1181-7. Collins GR, Essary L, Strauss J, Hino P, Cockerell CJ. Incidentally discovered distant cutaneous metastasis of sacral chordoma: A case with variation in S100 protein expression (compared to the primary tumor) and review of the literature. J Cutan Pathol 2012;39:637-43.